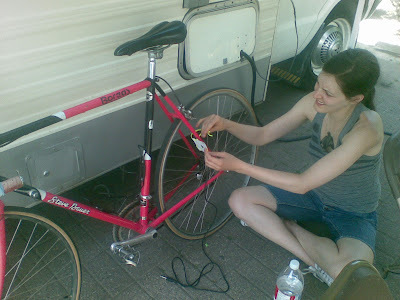 Last Saturday, TRUCK TR:AFICC Resident Jessica Thompson gave the first of two Bike Hack + Soundride workshops outside of CAMPER’s temporary Eau Claire home. It was the perfect day to hang around outside and tinker with electronics, not only weather-wise, beautiful as it was, but also because it was right in the thick of Folk Fest. What better time to draw attention to yourself with noisy bikes? For those that haven’t already seen the info floating around in cyberland, Bike Hack is a workshop in building bicycle-mounted noisemakers out of handmade contact microphones stuck to playing cards. 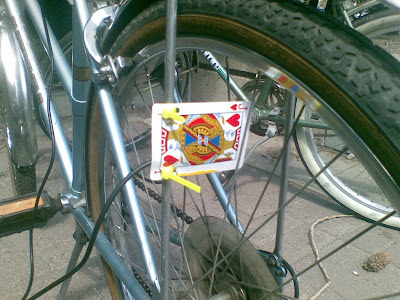 The cards then go into the spokes of your bike and are hooked into a small guitar amp mounted on the bike frame. Simple and genius, the resulting Soundride is a fun and dynamic way to engage crowds of hippies as a smug-performative-art-participant-and-environmental-champion. Or perhaps I’ll just speak for myself. 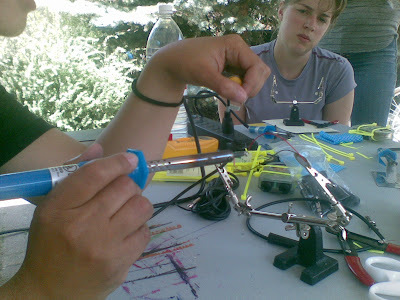 Jessica started off with a demo in soldering, something I personally had never done but something which turned out to be much easier and more straightforward than I would have thought. It probably had a lot to do with Jessica’s easy and clear instruction since she was able to warn me about the dangers that come with soldering without making me too nervous to try it. There isn’t much soldering to do though, so even if I had been nervous about it, the step up to the plate was a small one. It was small enough, in fact, that the hard-work to ego-boost ratio weighed heavily on the ego boost side. I’m starting to see where my smugness was born. Finally, once the contact mic was all mounted up it was an easy road to the Soundride; all there was left to do was to tape the mic to a playing card (Jack of hearts for me) and string that, along with the amp, to my bike frame with a series of bright yellow zip ties. After that, we were off on the ride sounding like a traveling bee hive. The small amps actually pack a surprising punch, they were much louder than their size led me to believe they could be. The Soundride itself kept to the bike trails just behind Eau Claire and drew many amused (and confused) looks from people out enjoying the day. It left me feeling excited to do this workshop again on Thursday night with Ride On!, and to take my noisemakered bicycle out to the Critical Mass ride on Friday. I’m looking forward to a few of the bikes shouting louder than the cars. There will be no curbing my smugness then.